We’d love your help. Let us know what’s wrong with this preview of Stones for Ibarra by Harriet Doerr. Richard and Sara Everton, just over and just under forty, have come to the small Mexican village of Ibarra to reopen a copper mine abandoned by Richard's grandfather fifty years before. They have mortgaged, sold, borrowed, left friends and country, to settle in this remote spot; their plan is to live out their lives here, connected to the place and to each other. The two Richard and Sara Everton, just over and just under forty, have come to the small Mexican village of Ibarra to reopen a copper mine abandoned by Richard's grandfather fifty years before. They have mortgaged, sold, borrowed, left friends and country, to settle in this remote spot; their plan is to live out their lives here, connected to the place and to each other. To ask other readers questions about Stones for Ibarra, please sign up. Does anyone know if there is an ebook version of Stones for Ibarra? I can't seem to find one. This is one of a handful of books that I always buy used in order to give away to people. What I liked best about it (as well as her "Consider this, Senora") as the poetic prose. Not too heavy, not too light. Not too flowery, not too sparse. Just right. Musical in a sense, but not obviously so. The kind of writing that's more a window than a door to help you see the beauty and sacredness that's inherent in "everyday life." What I especially liked in "Stones," however, was the very artful way -- s This is one of a handful of books that I always buy used in order to give away to people. What I liked best about it (as well as her "Consider this, Senora") as the poetic prose. Not too heavy, not too light. Not too flowery, not too sparse. Just right. Musical in a sense, but not obviously so. The kind of writing that's more a window than a door to help you see the beauty and sacredness that's inherent in "everyday life." I struggled with the rating for this book, because it probably deserves 5 stars. However, I as the reader had a little difficulty putting everything together so that the lower rating more likely represents a deficiency on my part instead of a commentary on the book itself. Nevertheless, this book is beautifully written, because the rhythm is very lyrical in nature. It's about a couple who move to Mexico in the 1960s to re-establish a mine that the husband's grandfather had abandoned in 1910. The I struggled with the rating for this book, because it probably deserves 5 stars. However, I as the reader had a little difficulty putting everything together so that the lower rating more likely represents a deficiency on my part instead of a commentary on the book itself. Nevertheless, this book is beautifully written, because the rhythm is very lyrical in nature. It's about a couple who move to Mexico in the 1960s to re-establish a mine that the husband's grandfather had abandoned in 1910. The couple's story is told through a series of vignettes that depict the numerous differences between Mexican and American cultures. What's interesting is that people die every day in this small Mexican town in strange and sometimes violent ways, and the husband in book, Richard, we learn at the onset of the book will also be dead within 5 years of the couple's move to Mexico. There is a connection between his death and those of the others in the book that I haven't quite put together in my mind yet. Even so, I became very wrapped up in the Ibarra community, and I had such admiration for the couple who moved there. They were the only foreigners in that town, and they had such a generosity about them, that I found them to be quite compelling as characters. Doerr's claim to fame seems to be that she published her first book, this one here, at the ripe young age of 74. She outlived her husband, who died of leukemia, and then went back to school to complete her unfinished BA and that led to here. Gentle and atmospheric are two things I struck me initially on starting this. Richard Everton abandons his career in the US to re-open a family owned mine in the middle of nowhere desert of Mexico. He brings his wife, Sara, and they move into an old run-down mansion in a tiny town, find plenty of locals willing to work the mine. Shortly afterward he is diagnosed with leukemia. Most of this is autobiographical. I always glance at the copyright page of a book, and in this case I immediately panicked. For the current challenge, I needed to be reading a book published in 1984, and the copyright started with 1978 (and then '81, '83, and '84). Sometimes the GR information is incorrect, but this was going to be beyond disappointing - and I was going to have to scurry around and find a replacement book. It turns out that the earlier copyrights were for stories published before the final publication of the nov I always glance at the copyright page of a book, and in this case I immediately panicked. For the current challenge, I needed to be reading a book published in 1984, and the copyright started with 1978 (and then '81, '83, and '84). Sometimes the GR information is incorrect, but this was going to be beyond disappointing - and I was going to have to scurry around and find a replacement book. It turns out that the earlier copyrights were for stories published before the final publication of the novel. Yes, stories. This is definitely a novel, but the construction is somewhat similar to Olive Kitteridge. Sometimes reading a lot of stories by a single author can feel repetitious, and this is true about some of the chapters in this. Here is the story of Richard and Sara Everton, but there is also the story of Ibarra, a village remotely located in the interior mountains of Mexico. Some 50 years earlier than our story was the 1910 Revolution, when Richard Everton's grandfather was forced to abandon his mining operation and flee the country. The Evertons return to Ibarra to reclaim the mine, to reinvigorate the village, and to live their lives. The driver of the station wagon is Richard Everton, a blue-eyed, black-haired stubborn man who will die thirty years sooner than he now imagines. On the seat beside him is his wife, Sara, who imagines neither his death nor her own, imminent or remote as they may be. Instead she sees, in one of its previous incarnations, the adobe house where they intend to sleep tonight. It feels like assigned reading for a high school English class. Like it is probably good for me somehow but I'm just not getting it. I didn't connect to any of the stories or characters. My favorite part was being done. I actually thought about how much I love this author when I picked the name Harriet for our daughter. Very nice voice in her writing. Author, Harriet Doerr's debut novel was published when she was 74 years old. She went back to school at the urging of her son, to finish her BA after surviving her husband and went on to become a Wallace Stegner fellow. She writes a fiction novel or novella from her experiences in Mexico. The story is gentle and revealing of North American life compared to that of rural Ibarra, Mexico. Sarah and Richard, a couple in their 40s leave California to reopen a mine in Ibarra abandoned by Richard's fam Author, Harriet Doerr's debut novel was published when she was 74 years old. She went back to school at the urging of her son, to finish her BA after surviving her husband and went on to become a Wallace Stegner fellow. She writes a fiction novel or novella from her experiences in Mexico. You should read this book even if it's not really your kind of thing. A couple, one just over 40 and the other just under, move from the Bay Area to rural Mexico to start up the husband's old family mine. The book feels more like a collection of short stories than a novel. The language is lyrical without being gushing and Jake will be happy to know that Doerr never dips into magical realism. There might be odd coincidences and an oddly humorous but sad bit in which an old priest is followed arou You should read this book even if it's not really your kind of thing. A couple, one just over 40 and the other just under, move from the Bay Area to rural Mexico to start up the husband's old family mine. The book feels more like a collection of short stories than a novel. The language is lyrical without being gushing and Jake will be happy to know that Doerr never dips into magical realism. There might be odd coincidences and an oddly humorous but sad bit in which an old priest is followed around by all the village dogs all the time, but there are no miracles. This isn't a travel book, nor is it some of that "see how poverty makes people noble" crap. Mostly it's about the wife's journey to both understand and deliberately misunderstand the people around her and the events in her life. It's sad but not that bleak. More on the "relentless tide of fate" side than the "all doom all the time" side. I take great solace in the fact that this was Doerr's first book published and she was 68. That means I have about 34 more years before it's too late for me to publish my great American novel. It was the winner of the "American Book Award" (whatever that is) in 1984, so I probably read it thirty years ago. The blurb on the back quotes the NYT: "A very good novel indeed, with echoes of Gabriel Garcia Marquez, Katherine Anne Porter, and even even Graham Greene". Pretty good company! I read this at the request of someone who has taught it for years and thinks it's all that. For me it was a mixed bag. The prose is elegant and almost deceptively simple. So why not 5 stars? Each chapter is basically a stand-alone story. It's kind of a patchwork of all of these stories of different characters and situations and how they all come together to make up this small Mexican town Ibarra. Where I got hung up is that is that I never had the drive to pick up the book and see what was going I read this at the request of someone who has taught it for years and thinks it's all that. For me it was a mixed bag. The prose is elegant and almost deceptively simple. So why not 5 stars? Each chapter is basically a stand-alone story. It's kind of a patchwork of all of these stories of different characters and situations and how they all come together to make up this small Mexican town Ibarra. Where I got hung up is that is that I never had the drive to pick up the book and see what was going to happen next, because there was no plot, per se. The author uses some odd devices that were off-putting, like announcing when she introduced the main characters that the husband was also going to die in 6 years, and how and where. That kind of "info bombing" throughout the book bothered me, because you never get the tension of not knowing. It's all just kind of laid out there for the reader like food on a buffet table, and you just move from dish to dish and sample each one. Which can be nice, but it is definitely different than a typical novel plot approach. So it's tricky to review because the writing itself was so lovely, and despite the smorgasbord, Doerr does finally bring it all together on the last page and let you into her reasoning of why she wrote it the way she did. But that was a LONG time to wait with no little tasty tidbits to keep me hanging on. I wouldn't discourage someone from reading this, but go into it knowing that it is more of a short story collection on related characters in the same town, and I think you will be a more satisfied reader than I was. I really wanted to love this book, mostly because it’s the first novel written by an elderly woman, and I love the idea of late-life accomplishment. And I did like it, but I didn’t love it. The story was reasonably interesting and the writing style was okay, but neither really wowed me. But I know some readers think this is a wonderful book and I did enjoy it so I wouldn’t want to dissuade anybody from reading it. The short story format of this book detracted from the fullest enjoyment of the writing, but the writing is so excellent and elegant, I had to give it a five-star rating. I move through Doerr's books slowly, going back to reread beautiful sentences and appreciate the subtle humor or irony. Perhaps it's in the back of my mind as well, that unfortunately, Doerr left us with only three books. The book is a novel but it springs from the author's experiences living in a remote Mexican village with he The short story format of this book detracted from the fullest enjoyment of the writing, but the writing is so excellent and elegant, I had to give it a five-star rating. I move through Doerr's books slowly, going back to reread beautiful sentences and appreciate the subtle humor or irony. Perhaps it's in the back of my mind as well, that unfortunately, Doerr left us with only three books. A book that made me cry. That doesn't happen often. So beautifully written. If you have spent time in the desert Southwest you will be reminded of simple landscapes that are often taken for granted. This is also a love story of exceptional beauty of a place, a people and a man. Not as good as her other Mexico novel, Consider This, Senora, but a good one nonetheless. Harriet Doerr finished her degree from Stanford at the age of 67 and received The National Book Award for her novel “Stones for Ibarra” in 1984 at the age of 73; talk about your late bloomer. From what I can gather, she did everything very deliberately and with painstaking effort. It’s said that when writing, she wrote little more than a sentence a day, meticulously crafting each sentence with the utmost care. And when reading her novel one can’t help seeing the result of her precision. If you enjoy wallowing in the trough of graceful, poetic prose, have I got a book for you. Listed among other worthy novels on the “100 Great American Novels You’ve (Probably) Never Read,” I first read and fell in love with this book twenty years ago and wanted to see how it held up. Not to worry; still spectacular. The book consists of several interconnected stories revolving around the lives of Sara and Richard Everton who have returned to Mexico in 1960 to restore his grandfather’s copper mine, abandoned since the 1910 revolution. They plan to finish out their lives in the small Mexican village of Ibarra. Both are around forty but the author makes it clear that Richard has only a few more years to live as he is suffering from leukemia. The charm of this book is the interaction with the simple, both profoundly poor and yet prescient Mexican people, as they go about their daily lives. They are fatalists, for the most part and bravely accept the cards they’ve been dealt while expressing deep faith in God and the belief in magic and the spiritual world. Their stories made me ache for them, so lacking were their lives. But they all maintained a fatalistic attitude that allowed them to quietly, bravely endure. 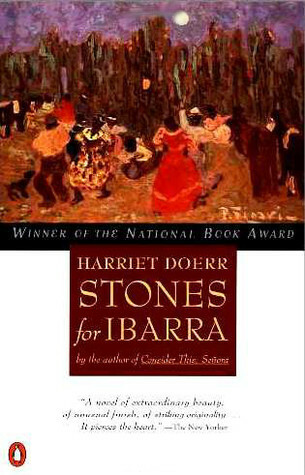 Stones for Ibarra is one of those books which should be read at least once in life. I thought that I will like this book as much as I like To Kill a Mockingbird or Frankenstein but I just couldn't. However, what made Stones for Ibarra a rediscovery of life for the Evertons was the division of chapters in stories of the people of Ibarra. If nothing else, Ibarra isn't one of those honest-to-God small towns in far off rural Mexico. While the community of Ibarra, from the cura to Remediosa Acostas, Stones for Ibarra is one of those books which should be read at least once in life. I thought that I will like this book as much as I like To Kill a Mockingbird or Frankenstein but I just couldn't. However, what made Stones for Ibarra a rediscovery of life for the Evertons was the division of chapters in stories of the people of Ibarra. If nothing else, Ibarra isn't one of those honest-to-God small towns in far off rural Mexico. While the community of Ibarra, from the cura to Remediosa Acostas, is fascinated and awed by the lifestyle of the American couple. It doesn't go unnoticed that the Evertons are actually subtly disapproving of them. Or more particularly their day-to-day routine. For Sara Everton, it is her ultimate belief in medicine and doctors that she ignores the glaring reality of her husband's deteriorating condition as a signal of his inevitable death. Yet for Richard Everton, it is much more about accepting it and moving forward and as a result, at times he forget that his wife is far behind him. authors first novel, won national book award. she was about 60 when she wrote it. about small town life in mexico, and ever present death, dancing with your melancholy self. I don't really know how to review this book, but I just say that I couldn't stop thinking about it. The main character came to Ibarra, thinking she could change things, but found that she was the one who changed. SERIOUSLY struggling with this book. One of the reviews says it's like reading a book assigned for high school english, and I can totally relate. Stones for Ibarra is an unusual novel in that the author discloses a pivotal eventual tragedy right up front, and with the characters’ knowledge. This gives her the freedom to focus on the inner life of the book’s main character, Sara Everton, an American married to Richard. The couple settle in Ibarra, Mexico to restart a mine once operated by Richard’s grandparents. The quixotic endeavor is warmly welcome by local residents for the jobs it eventually creates. The Evertons and inhabitants of Ibarra eventually learn to contend with the “odd ways” of each other. While the Evertons never fully understand the religious and superstitious traditions of the townspeople, they accept them with a sense of humor, a sentiment that is reciprocated by the local people. When the tragedy finally occurs, it is anti-climactic. The author instead concentrates on Sara’s foreboding beforehand, and the impossibility of acceptance afterward, all presented quite realistically. Doerr mines the subtext of everyday situations making this a novel of impressions that trigger profound emotions in Sara. To paraphrase the author at the end of the book – the line blurs between significant and trivial, all of it extraordinary. Harriet Doerr won the National Book Award for this book at the age of 73. Turns out it's never too late. This book started out as independent pieces of writing for a writing class and Doerr was persuaded by an instructor to assemble it into a novel. For me, this kept the story from flowing as naturally as it might have had there been more of a continuous narrative. It kept me from reading more quickly. It is all excellent writing, though. A California couple in their early 40's moves to the smal Harriet Doerr won the National Book Award for this book at the age of 73. Turns out it's never too late. A California couple in their early 40's moves to the small town of Ibarra in Mexico to reopen a mine that has been in the husband's family for years. They take on a completely different style of living and luxuriate in the slow pace of village life and a different culture. Mexico is presented as a barren but beautiful place, a calm but frequently violent place, a religious and superstitious place. The people take each day as it comes with an accepting "God only knows" attitude. It is an interesting contrast to American life where human control is always presumed. I look forward to reading Doerr's second book "Consider this, Senora". Harriet Doerr, like the Ethertons of her novel, also lived in a Mexican village for a while. The book is really a collection of vignettes and stories about the five years or so that an American couple lived in the tiny village of Ibarra while reopening a copper mine which once belonged to Richard Etherton's grandfather. The first paragraph of the book lets you know that Richard "will die 30 years sooner than he now imagines." That condition is kept a secret from the village but weighs heavily on Harriet Doerr, like the Ethertons of her novel, also lived in a Mexican village for a while. The book is really a collection of vignettes and stories about the five years or so that an American couple lived in the tiny village of Ibarra while reopening a copper mine which once belonged to Richard Etherton's grandfather. The first paragraph of the book lets you know that Richard "will die 30 years sooner than he now imagines." That condition is kept a secret from the village but weighs heavily on his wife Sara. So in that sense, there is no suspense. We know Richard will die even if not when or how. The writing is beautiful-- plain and yet so evocative of a place and time. There is a contrast between the superstitions of the people, the centrality of the Catholic faith, and the Etherton's agnostic way of life.